Research Roundup: 38th anniversary of smallpox eradication, the risks of third hand smoke, ear transplant for a soldier, and more! May 8th marks the 38th anniversary of smallpox eradication! A serious and highly contagious infectious disease caused by the variola virus, smallpox killed more than 300 million people in the 20th century, but now it’s a thing of the past, thanks to animal research. The basis for smallpox vaccination began in 1796 when Dr. Edward Jenner took material from a cowpox sore on a woman’s hand and inoculated it into a child’s arm. Months later, Jenner exposed the child a number of times to variola virus, but he never developed smallpox. (This work led to the term vaccine, from the root word vacca, which is Latin for cow.) In the 19th and 20th centuries, horses, mules, goats and rabbits were all used at one time or another to generate the virus, and in the 1970’s, calves became the standard for preparing the vaccine. After a global eradication campaign lasting more than 20 years, on May 8, 1980, the World Health Assembly declared smallpox eradicated (eliminated), and no cases of naturally occurring smallpox have happened since. The Hangover Pill. Inspired by the body’s natural approach for breaking down alcohol, researchers used three enzymes — derived from the liver — to more efficiently process alcohol. Tests on inebriated mice indicated that those given the new pill, had a 45% lower blood alcohol content after 4 hours, compared to the inebriated control without the pill. Also, the carcinogenic compound acetaldehyde, which is produced during normal alcohol metabolism and can cause headaches, remained extremely low. The team is currently conducting tests to guarantee the safety of the pill capsules, and plans to begin human trials within a year. This research was published in Advanced Materials. Third-hand tobacco smoke is widespread, and may be dangerous. New evidence demonstrates that tobacco from the air — second-hand smoke — can seep into buildings, then coat surfaces — third-hand smoke — and become airborne again, circulating throughout the building. Thus, just because you are in a non-smoking building or area, doesn’t mean you’re not exposed to tobacco. Mounting evidence over the past year supports this study and other research on mice reveals that third-hand smoke increases the risk of lung cancer, liver damage, and diabetes. Although these mouse studies have not be translated to humans, the effects of third-hand smoke are worrisome. Especially for babies or small children who are exposed to tobacco residue from clothing. The most recent report was published in Science Advances. Soldier ‘grew’ her own ear transplant. 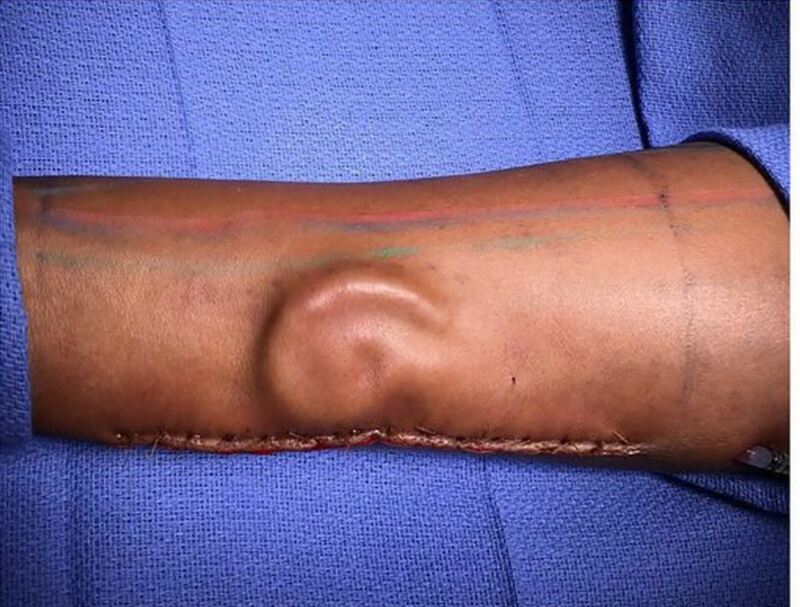 Surgeons at William Beaumont Medical Center in El Paso Texas, have successfully transplanted a soldier’s ear, which was carved from cartilage harvested from the soldier’s ribs and then placed beneath the skin of her arm to ‘grow’. This complicated procedure allows new blood vessels to form in the cartilage to provide touch sensation. Growing ears is not new science. Mouse research in the early 1990s proved it was possible and relatively easy to grow new human ears made from cartilage, famously known as the Vacanti Mouse. This is a great example of how mouse research can translate to human benefit and provides a promising future for more ear transplants. This report was published by the US Army. How can we improve mouse handling? Professor Jane Hurst, at the University of Liverpool, explains how hand-cupping or tunnel handling mice reduces anxiety in mice as compared to tail handling. The costs of staff training were considered to be outweighed by the benefits of more reliable behavioural and physiological responses in mice. The research was funded by the NC3Rs and the BBSRC in the UK, and the early research won the 2010 NC3Rs Prize. Previous Previous post: Let’s make it 500 voices in support of openness!